How Do You Connect the most Connected Educators in the Nation? CASE STUDY: How Do You Connect the most Connected Educators in the Nation? The 2010 National Education Technology Plan demonstrates the importance of educators becoming more connected to resources, tools, colleagues, experts, and learning activities, both within and beyond schools. Participation in online communities of practice is a key way educators connect. Robust online participation contributes both to individual excellence and to the vitality of the profession as a whole. The Connected Online Communities of Practice project has stewarded a scalable, sustainable ecology of online communities in education to improve teacher and leader effectiveness, enhance student learning and increase productivity.In 2012, the first Connected Educators Month was dedicated to connecting teachers to a myriad of examples of best practices, looking at design experiments and undertaking case studies, while developing new ideas about design and infrastructure that could better support educators. Now in it’s second year Connected Educators Month, (CEM) has created a community of it’s own, edConnectr. The thousands of participants of this years’ CEM will be able to make deeper, richer and more deliberate connections based on technology designed by introNetworks. In collaboration with the American Institutes for Research, their partners and talented educational designers, the introNetworks’ Visual Matching Engine has been fine-tuned to capture and connect the highly distributed participants in a purposeful way to encourage and enable peer-to-peer discussions and action. Participants will organize around topics of interests, areas of focus and learn from each other as they engage with activities surrounding CEM. The Profiles have been crafted to capture four dimensions of information including roles, areas of expertise, how they can help, where they need help and their professional interests. Teachers will be able to find others who can help with things like Action Research and Common Core Standards. Or they may offer to help others with challenges such as Self-Directed Learning and Classroom Management. Building strong, new relationships with peers is as important as making new connections to resources, tools and strategies to guide their professional development. 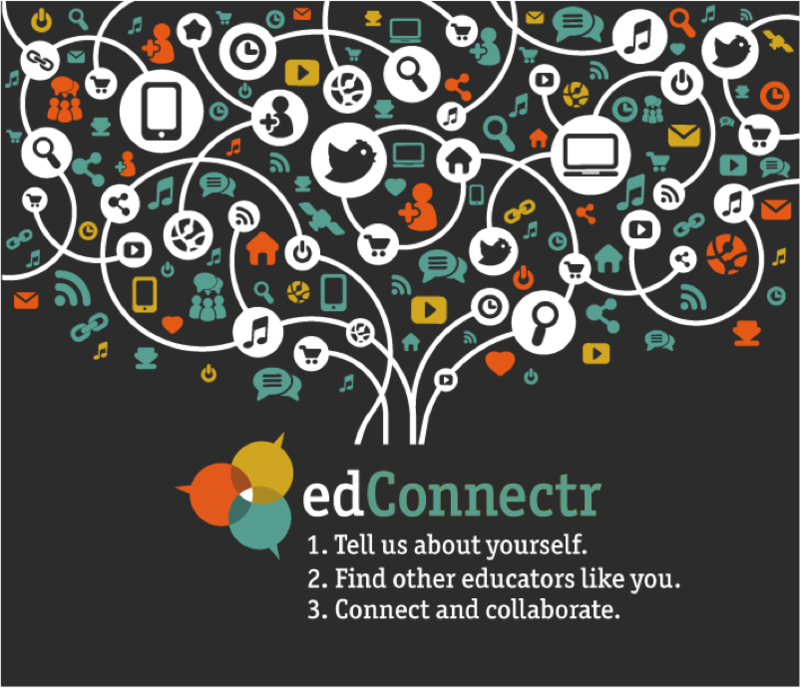 If you are involved in any way with Education, or know a teacher who is inquisitive, curious and looking to make new connections, encourage them to participate in Connected Educators Month and join in the edConnectr Community. There is a phenomenal amount of information and an amazing group of thousands of peers to get connected to.